and scars, and three flavors of tea. It would be perfectly understandable for most to take the stance of, "so you pay them to send you the samples the manufacturers give out for free?" Yes. That's exactly what I do. And for $10/month, I only get five samples—five samples that are not of my choosing, but do follow a profile I filled out. And now that I've poked around online (I usually discover trends right in the middle of their popularity, so I only discovered this recently, though it's been around awhile), I realize that other sites like Sephora are happy to send you samples for free with an order. Good for them. I don't care. I like Birchbox. I tell my friends about Birchbox. 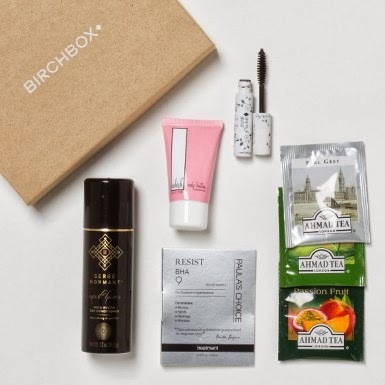 I am blogging about Birchbox as we speak. I've bought Birchbox gift subscriptions. And I have turned at least five people on to this nifty subscription service (which, btw, they do for men also...hint, hint). I am a mini Birchbox tornado blowing through peoples' lifeless hair, past their dull skin and across their unpainted fingernails to let them know that samples are on the way. Samples are on the way and everything is going to be fine! So yeah, you could say I'm paying them to send me free samples. But I think anyone who has ever received a Birchbox knows that what I'm really paying for has nothing to do with finding a mascara I'd pay $50 for. I mean, Maybelline and Cover Girl have long standing track records for being among the best and you can get them at any drug store. And I so rarely wear makeup...or even shower for that matter, haha....that it's not really about the beauty supplies. I mean, it is. But it isn't. It's about getting a box every month in the mail, and you have no idea what it contains. The picture shows what I got in my Birchbox, but my sisters got different stuff. Last month everyone I spoke to got something different in their box. You don't know what you're getting. And you may not like all of it. My sisters give the parts they don't like to their daughters (which sounds mean, but it's not...it's nail polish colors they're too mature for or hair products unsuitable for short hair...that kind of thing). But here's the thing...you get an email telling you it's on its way. And for those two or three days you're waiting, there's a delicious wondering about what you're going to get. A nice anticipation. It's something that, if you're having a bad day or week, you can look forward to. And it has tracking so you can watch it fly across the country to you....a little surprise, for you and from you! And you give the Best. Gifts. Ever!!!! so you know it's going to be good. Each month a box of love, beauty, mystery and possibilities falls on your doorstep. It's about more than paying $10 for a box of samples. It's about reviving magical pockets of wonder within you that, even if you're a very young 50 like me, you might have long ago forgotten.